Exciting things are happening at Mi Casa Azul Gallery— after more than 6 years downtown we decided the time was right to make a move! Our new location is in the “up and coming” area of Animas Bajas on the road to Flora Farms and we couldn’t be happier. Now we are officially the first Art Gallery in the area. We’ve taken this opportunity to customize the space and showcase our beautiful art. We are so pleased with the results and we can’t wait to have you visit! Wandering through I'll space you'll enjoy reading about the history and inspiration of some of Tamara Santini's original pieces. We also feature Tlaquepaque Ceramic artist Paco Padilla– the only gallery in Baja to carry his line! Of course, you can't miss admiring our custom painted Otomi wall. 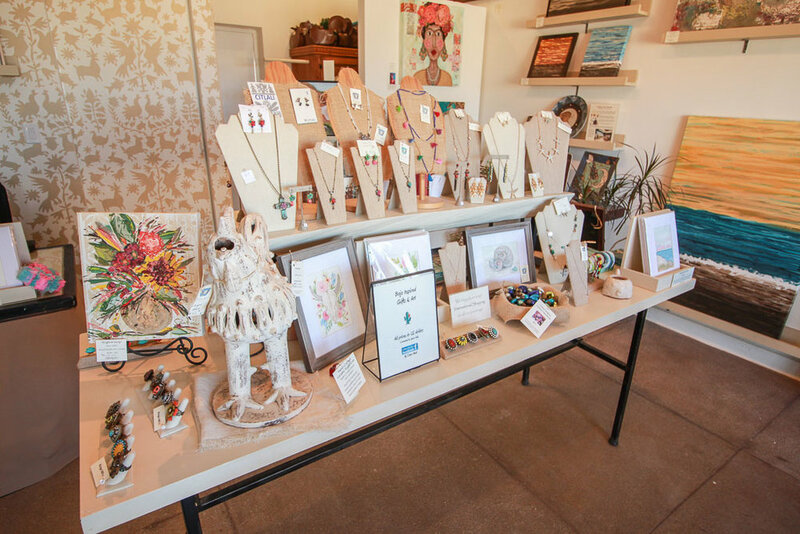 Tamara also collaborates with a local glass blower to bring one-of-a-kind pieces to Mi Casa Azul. If that isn't enough we also carry a limited selection of jewelry and scarves for the perfect carry-on gift! Our new location is on the hilltop above Flora Farms, parking is available in front, on the street, or in a lot in the back. We are so thrilled to bring art to the area!